Sterling K. Brown knows costar Justin Hartley is the only Chicago-area native with a lifelong obsession of the L.A. Dodgers. Milo Ventimiglia is quick to answer "the man loves tea" (specifically peppermint with honey and lemon) when quizzed about Brown's drink of choice and everyone involved with This Is Us knows how much Ventimiglia loves to drop a good F-bomb. "He works in profanity like artists work in clays or oils," jokes Hartley. Never in anger, though, notes Brown, "It's like pure exuberance of f--k."
So what does it matter really that Mandy Moore wasn't aware that of all the emojis she overuses, Chrissy Metz most prefers the big red heart or that Brown believes Hartley's favorite artist is Justin Bieber? As Moore wrapped up the taping of The Hollywood Reporter's 2017 test, "We kinda know each other....You know what the most important thing is? We love each other." What's not to love, really? Having just wrapped their third season with another cliff-hanger, the beloved, award-winning NBC drama, which weaves seamlessly between past, present and future to chronicle the trials of the deeply connected Pearson family, is still garnering ratings (more than 10 million tuned in for September's premiere) and that all-important water cooler chatter, having successfully avoided the dreaded sophomore (or junior year) slump that can befall a show that makes a particularly successful debut. The key, Ventimiglia tells E! News, was sticking with what worked from the start: this idea that people, while certainly flawed, are inherently good. "When something comes out of the gate so strong and they think they need to go bigger and wider...the thing is not to change the formula." So they didn't, striking the perfect balance of wrapping up certain storylines in a gratifying manner (the mystery of Jack's death could have certainly been dragged out longer than a season and a half), while leaving others lingering just long enough to maintain interest. The cast is equally satisfied, raving about the complex material they're able to dig into each week. And the pay's not bad either. In a move once perfected by the Friends cast, the actors who comprise the five adult Pearsons—Ventimiglia, 41, Moore, 34, Brown, 42, Metz, 38, and Hartley, 42—banded together to renegotiate their contracts ahead of their third year. While some of the bigger names arrived on set with sizable paydays, others were making as little as $40,000 per episode. Their salary now: a not-too-shabby $4.5 million a season. Plus, they actually like coming to work. No, really. Asked by E! News' Sibley Scoles to dish about who the straggler was when it comes to call times, cast members were stumped. "No one's late to set," Ventimiglia asserted. "Everyone's excited to be there." For some, their arrival on the Universal lot was the culmination of years of toiling, accepting parts that paid the bills, but didn't catapult them into well-known actor territory. For others, it represented an intriguing next step in careers that were solid, but lacking that one defining role. And for creator Dan Fogelman it was finally getting past the block that had left his half-finished film script—a project built toward the reveal that the eight seemingly disparate characters chronicled throughout the film were actually a family of octuplets—languishing in a drawer. A new production deal with 20th Century Fox TV inked in 2015 saw him dusting off the pages, trimming out a few siblings and reworking the whole idea as a setup for a TV series (tentatively titled 36, a name Fogelman never quite liked) where he'd have the luxury of time to devote to the characters. The personas he had created immediately jumped out to Moore, who had previously worked with Fogelman when she voiced Rapunzel in 2010's Tangled. Though the former teenage pop star that once sang about missing someone like candy already had dozens of films and TV spots on her resume (standouts included teen fare such as A Walk to Remember and Saved!) her career was feeling stagnate. "I was hesitant about throwing myself in the ring after three failed pilots, but the script was undeniable," she shared with Deadline. "I'm a huge fan of Dan's and felt certain that I was Rebecca and was dying to be a part of it." That feeling increased exponentially when she tested with Ventimiglia "because the chemistry was so effortless and palpable." The Gilmore Girls and Heroes alum wasn't Fogelman's initial choice. Having written Jack somewhat in his own likeness, he was looking for more of an everyman. But casting pushed him to consider the well-built small screen heartthrob and after one reading ("I did what came out of me in regards to Jack, and I felt this very blue-collar tie to him," Ventimiglia told Deadline), he was sold. Pilot directors John Requa and Glenn Ficarra then urged Fogelman to consider Brown, having worked with him on 2016's Whiskey Tango Foxtrot. The actor, still shooting his Emmy-winning turn as prosecutor Christopher Darden in FX's The People v. O.J. Simpson, used the meeting to gush about Fogelman's creation of Crazy, Stupid Love and the pilot script. As Brown told Deadline, "It was an opportunity for me to go in and tell him how much I appreciate his work." By early November, he had been cast alongside Moore, Ventimiglia and soap opera veteran Hartley, who told Deadline he burned through the pilot script, phoned up his agent "and said, 'You got to get me in the room.' I knew I had a special take on Kevin." But Metz, whose biggest screen credit to date was the role of "fat lady" on American Horror Story: Freak Show, was still lying in wait. She had exactly 81 cents in her bank account and was living off ramen noodles when she was asked to return for a callback, competing against another woman who NBC Entertainment president Jennifer Salke would later describe to The Hollywood Reporter as "a sort of 'Hollywood overweight person,' struggling with losing, maybe 20 pounds." Metz's authenticity won out, the actress recalling the second audition as "unlike any other I had ever experienced. Dan, John and Glenn really worked with me through every scene. Glenn even asked me to grab my purse out of the lobby and walk into the scene through the door. It was as if they were already directing me." Even casting the leads' younger counterparts was a thoughtful journey. "You have to look on multiple prongs. Do they resemble the characters that have been established already? Then, do they play the age?" casting director Tiffany Little Canfield explained to The Hollywood Reporter of narrowing down streams of child stars to a pair of Kevins (Parker Bates, 11, and Logan Shroyer, 19), Randalls (Lonnie Chavis, 11, and Niles Fitch, 17) and Kates (Mackenzie Hancsicsak, 11, and Hannah Zeile, 21). Finding talents that are physically similar to the adult actors isn't an exact science, she noted, "We don't have time machines. The person is going to have to approximate it, and I think it's really about nailing the essence of the character that is the most important thing, because even if they match a certain physical aspect of the person but they can't act or their energy is completely different, I think the audience will actually have a harder time buying them in the role than someone who maybe has a slightly different physical aspect." The process ultimately reunited Zeile with Metz, who used to represent the young actress during her days as a talent agent. "It's full circle," exclaims Metz. "Life is so crazy. I've been a huge fan of hers for as long as I've known her." Their story, while proof that everyone in Hollywood's insular community is but a few degrees of a separation apart, isn't unique to the cast. As Randall and Beth Pearson, Brown and Susan Kelechi Watson are the fictional embodiment of #couplesgoals. Though many are quick to assign that term to any duo that seems to appear happy on Instagram and able to withstand a little gentle ribbing, these two are the grown-up version, handling the real life tough stuff as a team, no matter how angry they may be in the moment or how many nights Randall is relegated to the couch. "It never occurs to Beth and Randall that anything is a deal-breaker, especially from Beth's part," Brown shared with Entertainment Weekly. "She's had a lot of stuff sprung on her by her husband in terms of bio dad and brothers up in the crib. It's just something that we need to work through and figure out. You have two people who genuinely choose each other day in and day out, and say, 'I do.' That is lovely." And while the classically trained duo are certainly skilled enough to portray a couple some 17 years deep, they had a bit of an assist in the getting to know you department, having run in similar circles as MFA students at New York University. "I remember Sue, before she even got to school, was dating a guy in the class above my class. And so I'm all, 'Who's this little cute girl who Dre is going out with?' They're like, 'Yeah, that's Susan Kelechi Watson.' I was like, 'Oh. She's cool,'" he told EW, noting he observed a few of her theater rehearsals. "I just remember watching you in your process do incredibly beautiful and nuanced work, and just being a fan of your talent." Responded Watson, "I remember going specifically to see Father Comes Home from the Wars at the Public and fangirling out because there is this specific work that can happen on film and television that the camera catches, but sometimes it's harder to do that same type of intimate specific work in a theater space. Sterling was capturing all of that in Father Comes Home from the Wars, and I remember in that moment thinking, 'Oh, yeah, he's NYU.'" Two decades later, that mutual admiration is still firmly in place. Having developed the type of shorthand that allows them to pivot mid-scene (each particularly remember the line, "You got me out here sweating like Biggie Smalls!" that Watson improvised while running through a Beth-Randall fight), "We have so much fun with each other," gushed Brown. "Whether it's a serious or sincere scene, there's still this sense of play that underscores everything that we do that I have appreciated. It's always a joy." Most days, he said, he comes home to wife Ryan Michelle Bathe (another NYU grad) and exclaims, "I love me some Susan Kelechi Watson! We have so much fun." But, frankly, it's nice to really like the people you log so many hours with. And to become such an intrinsic part of their worlds that there was no question the cast would be partying it up at Hartley and Moore's recent weddings. By all accounts, the kumbaya-like atmosphere starts from the top down with Ventimiglia taking his role as Pearson family patriarch quite seriously. "I study the call sheets so that I know everyone's name," he earnestly told The Hollywood Reporter. He's also the one who maintains the various text message chains—one for the entire cast and Fogelman; another for Pearsons only—and comes up with small ways to keep morale levels soaring. Take the time the prop department wanted to buy Ventimiglia's Chevelle to use as Jack's car. His sole demand: "Whatever you're gonna pay me for it, that goes back towards coffee trucks and burger trucks for the crew." Or when he returned from the first summer hiatus having made trucker habits bearing the words "Jack's Big Three Homes" for every member of the cast and crew. 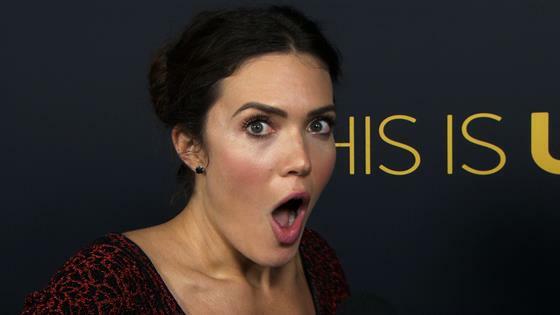 This Is Us Season 3 Mystery: Who Is "Her"? "I'm definitely the father," he admitted to Us Weekly of his paternal role. And though Moore is the youngest adult in the cast (at nearly 35, she's several years behind all of her TV children), she's "definitely the mother. But I think we both feel protective of our group. Not just our cast but our entire group," continued Ventimiglia. "There is a level of looking out for everyone. I know Susan has called me 'Papa Pearson' or 'Papa Bear' before. So if she says it it must be true." She's not the only one singing his praises. Hancsicsak, who plays the littlest version of Kate, says her onscreen parents make it a point to look out for them. "Mandy and Milo are awesome," she told InStyle. "They were both child actors like we all are, so they know exactly how we feel. They're the first ones to hug us when we see them on set. Milo gave us all little wooden tops to keep in our pockets, and he also brought in an old Gameboy and games for us to play with on set. Mandy also gave me her favorite lip gloss, which was very special to me. And they always take pictures of us and post them like they are our parents and are proud of us. I really love them." More importantly, they really love each other, with Ventimiglia joking he thought Moore's now-husband Taylor Goldsmith should have asked his blessing before proposing. Their chemistry was in place from the start. "We literally, like, met in a handshake in a test for the roles and we just kind of naturally fell into it," he told E! News. But they continue to stoke it, making it a point to watch every episode together, usually in Fogelman's office, Moore told The Huffington Post. To date, they've missed one: "It's like our little tradition." She, like the rest of the cast, refers to the two-time Emmy nominee as the captain of their ship. ""He's the one that galvanizes everyone to hang out together," she told E! News. "Somehow information makes its way to him first," she said. "I'm surprised he didn't know about the pick-up before any of us. He's that guy. He knows everyone. Everybody loves him. He talks to everybody." And perhaps that, more than anything else, speaks to the success of the series. Though it's not necessary that an actor have much of anything in common with a character to realistically embody them (see: Bryan Cranston's portrayal of Breaking Bad's Walter White), the drama's leads speak of the kinship they feel to the people they play. Brown often finds himself infusing his experiences, as a successful black man who's also an adoring husband and father to two sons, into the aura of Randall, Hartley admits he shares so much in common with Kevin, from the obvious (his chosen career path) to select traits such as a fear of heights and tendency towards sea sickness, that at time he's wondered, as he told Glamour, "Is Dan following me around?" And Metz knew from the moment she read Fogelman's initial script that she was Kate, a role largely inspired by his sister Deborah, who Metz has friended on Facebook. "I remember reading those lines like, 'I'm always going to be afraid of a chair breaking underneath me' or 'whether people will be able to recognize if I'm actually pregnant,'" she told THR, "and going to Dan, in tears, like, 'These are my fears.'" And, of course, there's the obvious, that the cast, from the oldest Pearsons down to the elementary schoolers feel like actual blood relations. "It is like a family," Brown told Elle. "It seems so clichéd, like, 'Do they really love each other as much as it seems?' The answer is yes! The joy is what I feel for my brother and sister, for my wife, for my mother and father, my mom who's younger than me, and my dad who's younger than me, these kids, my children, the younger versions of us." Because while they're certainly talented enough to make it work, that genuine affection that viewers feel coming from their screens is completely authentic. "You can't fake a relationship on-screen if you don't have it off-screen," Brown insisted. 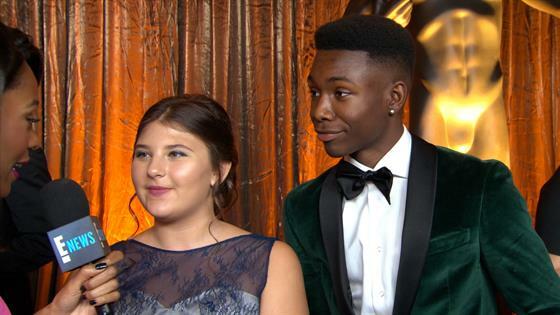 "I don't know what the alchemy is, what Dan Fogelman saw in all of us…but he brought together a group of wonderful thespians who happen to be even better individuals."